Developing a comprehensive understanding of the reactivity of uranium-containing species remains an important goal in areas ranging from the development of nuclear fuel processing methods to studies of the migration and fate of the element in the environment. Electrospray ionization (ESI) is an effective way to generate gas-phase complexes containing uranium for subsequent studies of intrinsic structure and reactivity. Recent experiments by our group have demonstrated that the relatively low levels of residual H2O in a 2-D, linear ion trap (LIT) make it possible to examine fragmentation pathways and reactions not observed in earlier studies conducted with 3-D ion traps (Van Stipdonk et al. J. Am. Soc. Mass Spectrom. 14, 1205–1214, 2003). In the present study, we revisited the dissociation of complexes composed of uranyl nitrate cation [UVIO2(NO3)]+ coordinated by alcohol ligands (methanol and ethanol) using the 2-D LIT. With relatively low levels of background H2O, collision-induced dissociation (CID) of [UVIO2(NO3)]+ primarily creates [UO2(O2)]+ by the ejection of NO. However, CID (using He as collision gas) of [UVIO2(NO3)]+ creates [UO2(H2O)]+ and UO2+ when the 2-D LIT is used with higher levels of background H2O. Based on the results presented here, we propose that product ion spectrum in the previous experiments was the result of a two-step process: initial formation of [UVIO2(O2)]+ followed by rapid exchange of O2 for H2O by ion-molecule reaction. Our experiments illustrate the impact of residual H2O in ion trap instruments on the product ions generated by CID and provide a more accurate description of the intrinsic dissociation pathway for [UVIO2(NO3)]+. The online version of this article ( https://doi.org/10.1007/s13361-018-1947-5) contains supplementary material, which is available to authorized users. Developing a comprehensive understanding of the reactivity of uranium species  remains important to the development of nuclear fuel processing methods  and studies of the migration and fate of the element in the environment [3, 4]. Electrospray ionization (ESI) is an effective tool for production of gas-phase complexes containing uranium in high oxidation states . Our group was among the first to use ESI to generate gas-phase, doubly charged complexes containing the uranyl ion (UVIO22+) for studies of intrinsic structure and reactivity (i.e., outside of the influence of solvent or other condensed phase effects) in a species-specific fashion [6, 7, 8, 9, 10, 11, 12, 13, 14, 15]. For example, ESI was used to generate the first complexes containing UVIO22+ coordinated by ligands such as acetone (aco) or acetonitrile (acn) for collision-induced dissociation (CID) and ion-molecule reaction experiments [6, 7]. Since then, ESI has been used to create gas-phase uranyl species for a range of tandem mass spectrometry, ion mobility, and anion photoelectron spectroscopy studies [16, 17, 18, 19, 20, 21, 22, 23, 24, 25, 26, 27, 28, 29, 30, 31, 32, 33, 34, 35, 36, 37, 38, 39, 40, 41]. 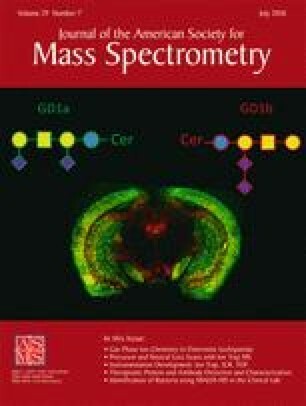 More recently, ESI and tandem mass spectrometry have been used to study and compare the reactivity of transuranic species [42, 43, 44, 45, 46, 47, 48, 49, 50]. For example, ESI was used to produce acn and aco complexes of PuVIO22+ and UVIO22+ solutions for an examination and comparison of gas-phase reactions under similar experimental conditions . More recent experiments by our group have demonstrated that the 2-D, linear ion trap (LIT) can provide access to fragmentation pathways and reactions not observed in earlier studies with 3-D ion traps [51, 52, 53, 54, 55]. For example, our past studies of the dissociation behavior of gas-phase actinyl complexes using a 3-D ion trap were complicated by high yields of product ions obviously generated by collisions with background H2O. Relatively high levels of H2O in the ion trap (ca. 10−6 Torr) create hydrated ions or lead to charge reduction reactions that form products such as [UVIO2(OH)]+ and [UVO2]+ and larger hydrated complexes containing these cations [6, 7, 43]. Ligand (H2O) addition reaction rates were so fast that UVIO22+ cations coordinated by two or three aco ligands, generated by CID of larger precursors, hydrated to generate heterogeneous, tetra- or pentacoordinate complexes that dominated the product ion spectrum . This prevented the detailed investigation of complex ions containing UVIO22+ and two or fewer ligands. However, a more recent investigation of the fragmentation behavior of UVIO22+ complexes containing acn  demonstrated that the lower partial pressures of background H2O in the LIT allowed us to produce bare UVIO22+ by multiple-stage CID and generate an NUVIO+ product by CID of [UVIO2(NC)]+. While gas-phase NUVIO+ had previously been created by insertion of U+ into NO , our experiments demonstrated that the species can also be produced in a CID reaction via a putative cyanate intermediate. Similar experiments have now been conducted with aco-coordinated UVIO22+, and novel products such as [UVIO2-HCO]+ and [UVIO2-CH2CH3]+ have been identified using a combination of isotope labeling and high-resolution/high-accuracy mass measurements . In one early study by our group that used a 3-D quadrupole ion trap instrument, multiple-stage tandem mass spectrometry (MSn) was used to determine the dissociation pathways for several cationic species, generated by ESI, and composed of (1) the uranyl ion, (2) nitrate or hydroxide, and (3) water or alcohol . In general, CID of the uranyl complexes resulted in elimination of coordinating water and alcohol ligands. For under-coordinated complexes containing nitrate and one or two coordinating alcohol ligands, the elimination of nitric acid was observed, leaving a uranyl alkoxide ion pair. For complexes with H2O ligands, MSn CID led to the generation of [UVIO2(OH)]+ and [UVIO2(NO3)]+. Subsequent CID of [UVIO2(OH)]+ produced UVO2+. The base peak in the spectrum generated by the dissociation of [UVIO2(NO3)]+, however, was an H2O adduct to UVO2+. The abundance of the species was greater than expected based on previous experimental measurements of the (slow) hydration rate for UVO2+ when stored in the ion trap . To account for the production of [UVO2(H2O)]+ from [UVIO2(NO3)]+, a reaction involving collisions with water in the ion trap, with reductive elimination of NO3, was proposed. In the present study, the CID of these species was re-examined using the 2-D LIT employed in our most recent investigations, with the goal of determining whether additional, previously obscured dissociation pathways would be revealed under gas-phase conditions in which the level of residual H2O was lower. As discussed below, the dominant product ion following CID of [UVIO2(NO3)]+ is [UVO2(O2)]+, rather than [UVO2(H2O)]+. To determine whether this result was due to the use of a different mass spectrometer, H2O was deliberately added to the vacuum system of the LIT. Under conditions that included higher levels of background H2O, CID of [UVIO2(NO3)]+ created [UVO2(H2O)]+ and UVO2+, consistent with our earlier study using the 3-D ion trap . No formation of [UVO2(O2)]+ was observed with the higher levels of residual H2O. The experiments in the LIT allow for a revision of the previously proposed mechanism for the decomposition of [UVIO2(NO3)]+ to one that involves a two-step process: initial formation of [UVIO2(O2)]+ followed by rapid exchange of O2 for H2O by ion-molecule reaction. Our experiments further illustrate the extent to which the presence of residual H2O in ion trap instruments influences dissociation patterns and pathways, and provide a more accurate description of the intrinsic dissociation pathway for [UVIO2(NO3)]+. Uranyl nitrate hexahydrate (UVIO2(NO3)2●6H2O) was purchased from Fluka/Sigma-Aldrich (St. Louis, MO) and used as received. Methanol (CH3OH) and ethanol (CH3CH2OH) were purchased from Sigma-Aldrich Chemical (St. Louis, MO) and used as received. A stock solution (1 × 10−3 M) of UVIO2(NO3)2●6H2O was prepared by dissolving the appropriate amount of solid material in deionized H2O. Because the uranyl nitrate solid is several years old, a “fresh” sample was also prepared by combining 2–3 mg of UVIO3 (Strem Chemicals, Newburyport, MA), corresponding to approximately 7 × 10−6 to 1 × 10−5 mol, with a twofold mole excess of nitric acid (Sigma Aldrich, St. Louis, MO) and 400 μL of deionized/distilled H2O in a glass scintillation vial. The solution was allowed to incubate on a hot plate at 70 °C for 12 h. Caution: uranium oxide is radioactive (α- and γ-emitter), and proper shielding, waste disposal, and personal protective gear should be used when handling the material. When cooled, 20 μL of the resulting solution was diluted with 800 μL of 50:50 (by volume) H2O/CH3OH or H2O/CH3CH2OH and used without further work up as the spray solution for ESI-MS.
ESI and CID experiments were performed on a ThermoScientific (San Jose, CA) LTQ-XL LIT mass spectrometer. The spray solutions were infused into the ESI-MS instrument using the incorporated syringe pump at a flow rate of 5 μL/min. In the positive ion mode, the atmospheric pressure ionization stack settings for the LTQ (lens voltages, quadrupole and octopole voltage offsets, etc.) were optimized for maximum transmission of singly charged ions such as [UVIO2(NO3)(CH3OH)3]+ and [UVIO2(NO3)(CH3CH2OH)3]+ to the LIT by using the auto-tune routine within the LTQ Tune program. Helium was used as the bath/buffer gas to improve trapping efficiency and as the collision gas for CID experiments. For CID, precursor ions were isolated using a width of 1.0 to 1.5 mass to charge (m/z) units. The exact value was determined empirically to provide maximum ion intensity while ensuring isolation of a single isotopic peak. To probe CID behavior in general, the (mass) normalized collision energy (NCE; as defined by ThermoScientific) was set between 5 and 18%, which corresponds to 0.075–0.27 V applied for CID with the current instrument calibration. The activation Q, which defines the frequency of the applied radio frequency potential, was set at 0.30 and the activation time employed was 30 ms. High-purity He (~ 1 mTorr in the LIT) was used as the collision gas. To probe gas-phase reactions of selected precursor ions with background H2O, ions were isolated using widths of 1–2 m/z units. Again, the specific width used was chosen empirically to ensure maximum ion isolation efficiency. The ions were then stored in the LIT for periods ranging from 1 ms to 10 s. Despite the lower H2O levels in the 2-D LIT under normal operating conditions, there is still a sufficient partial pressure of the neutral to permit an investigation of ion-molecule reactions, particular when using long isolation times. For both CID and ion-molecule reaction (IMR) experiments, the mass spectra displayed were created by accumulating and averaging at least 30 isolation, dissociation, and ejection/detection steps. Our instrument is not currently configured to allow the controlled introduction of neutral species into the LIT for detailed investigations of IMR. To increase the amount of background H2O in the vacuum system, the instrument was turned off, the vacuum chamber vented, and held at room temperature and pressure for 12 h. After a pump down time of 3 h, CID experiments were performed using the same precursor ions using similar CID and IMR parameters, but under what we refer to in later sections as relatively “high” levels of residual H2O. Though the partial pressure of H2O in the ion trap is not known, as discussed later, evidence for higher H2O levels was apparent in the CID product ion distributions. As noted earlier, our previous study involved MSn experiments with a 3-D ion trap instrument to determine the dissociation pathways for complexes containing [UVIO2(NO3)]+ coordinated by water or alcohol ligands . The multiple-stage CID spectra initiated with the dissociation of, for example, [UVIO2(NO3)(CH3OH)3] were complex, and contained product ions from fragmentation reactions and H2O adducts to those product ions formed by association reactions with H2O present as a contaminant in the He buffer/bath gas. In the earlier experiments, the H2O adducts were identified by characteristic peak tails and chemical mass shifts (shifts of 0.2–0.3 u lower than expected mass). It had been proposed that the asymmetric peak shapes and mass deficits may be tied to the formation of fragment ions from particularly “fragile” precursors because of the application of resonance ejection, and the magnitude of the resonant ejection amplitude for ion ejection during mass analysis using ion traps . The ejection of the fragment ions, which “appears as premature ejection of the fragile ion, leads to the appearance of peak fronting and a mass shift” . The reader is directed to reports by Yost and coworkers  and Vachet et al. , for specific details. Formation of adducts can also be confirmed by isolating expected product ions in the ion trap for periods of 10–100 ms, without an applied collision voltage (NCE). During the isolation step, all ionized species except the one chosen for storage are resonantly ejected from the ion trap. The appearance of peaks 18 u higher than the isolated ion is indicative of the formation of H2O adducts and their abundance increased as the isolation and storage time was extended. in which an energetic collision with H2O in the ion trap mass causes the formation of an activated ternary complex, rapidly followed by the reductive elimination of NO3 radical (with electron transfer to the uranyl ion) to leave the hydrated, reduced uranyl ion. It was this result in particular that prompted the study presented here. The ESI and MSn CID spectra collected on the 2-D LIT instrument, using a solution of (commercially available) uranyl nitrate in a mixture of H2O and CH3OH, are shown in Fig. 1. With this solution, ESI (Fig. 1a) generates [UVIO2(OCH3)(CH3OH)2]+, [UVIO2(NO3)(CH3OH)2]+, and [UVIO2(NO3)(CH3OH)3]+ at m/z 365, 396, and 428, respectively. CID of [UVIO2(NO3)(CH3OH)3]+ (MS/MS stage, Fig. 1b) causes elimination of a single CH3OH ligand to produce [UVIO2(NO3)(CH3OH)2]+, which in a subsequent stage (MS3 stage, Fig. 1c) loses another CH3OH ligand to create [UVIO2(NO3)(CH3OH)]+ at m/z 364, or HNO3 to leave [UVIO2(OCH3)(CH3OH)]+ at m/z 333. Subsequent CID of [UVIO2(NO3)(CH3OH)]+ (MS4 stage, Fig. 1d) primarily causes the elimination of HNO3 to leave [UVIO2(OCH3)]+ at m/z 301, and [UVIO2(NO3)]+ at m/z 332 was also observed at ~ 10% relative intensity. In general, the fragmentation reactions to this point are in agreement with our earlier study that used the 3-D ion trap . However, one notable difference is that the number and intensity of H2O adducts are greatly diminished in the present experiments, consistent with several recent studies by our group [51, 52, 53, 54, 55]. For example, the only adduct observed at relative intensity greater than 1% appears at m/z 382 (addition of H2O to [UVIO2(NO3)(CH3OH)]+ at m/z 364). CID of [UVIO2(OCH3)]+ at m/z 301 (MS5 stage, Fig. S1a) generates UVO2+ at m/z 270 and UVIO2H+ at m/z 271, in agreement with a recent comparison of the fragmentation pathways of [UVIO2(OCH3)]+ and [UVIO2(OCH2CH3)]+ . More importantly, CID of [UVIO2(NO3)]+ (MS5 stage, Fig. 1e) generates UVO2+ at m/z 270, and the dominant fragment ion appears at m/z 302. The neutral loss to make the ion at m/z 302 corresponds to 30 u, and given the composition of the precursor ([UVIO2(NO3)]+), it is reasonable to conclude that this corresponds to elimination of NO to leave an ion with a formula of UO4+ as shown in reaction 2. This reaction pathway was not observed in our previous examination of the CID of H2O and alcohol-coordinated [UVIO2(NO3)]+. Subsequent CID of UO4+ caused the formation of UVO2+ by elimination of O2 (MS5 stage, Fig. S1b). While the appearance of the ion at m/z 302 in the CID spectrum of [UVIO2(NO3)]+ was a surprise, generation of a product with a formula of UO4 is not without precedent. For example, in a recent study of gas-phase binary and complex oxide anion molecules of protactinium and uranium, the oxalate species [UVO2(C2O4)]− exhibited the spontaneous replacement of the oxalate ligand by O2 to leave UVIO4− and two CO2 molecules . Quantum chemical calculations suggested that the structure of UVIO4− includes a distorted UVIO22+ core coordinated in the equatorial plane by two equivalent O atoms. We note that a UO4− ion has also been observed in CID experiments initiated with precursor anions such as [UVIO2(NO3)3]−, [UVIO2(ClO4)3]−, and [UVIO2(CH3COO)3]− . More important to the present study, a UO4+ cation was produced by Duncan and coworkers by laser vaporization and supersonic expansion and studied with infrared laser photodissociation spectroscopy using Ar atom pre-dissociation . The IR action spectrum of UO4+Ar2 was collected in the O=U=O and O=O stretching regions, and spectral and structure assignments were made with the assistance of high-level computational quantum chemistry. UO4+ was found to have a central UVO2 core, with O2 bound side-on in a η2 coordination mode, as suggested in previous experimental and theoretical studies of the addition of molecular O2 to UVO2+ complexes in the gas phase [60, 61, 62, 63]. Therefore, the composition of the ion at m/z 302, created in the present study by CID of [UVIO2(NO3)]+, is assigned as [UVO2(O2)]+ and is assumed to have the structure revealed in the pre-dissociation experiments . Formation of [UVO2(O2)]+ by CID in the LIT instrument was not dependent on the specific precursor used for the multiple-stage CID experiments. For example, multiple-stage CID initiated with either [UVIO2(NO3)(CH3CH2OH)2]+ or [UVIO2(NO3)(H2O)2]+, using the commercially available nitrate salt, led to formation of [UVIO2(NO3)]+, which subsequently dissociated to leave [UVO2(O2)]+ and UVO2+ (spectra not shown). We also investigated whether or not the formation of [UVO2(O2)]+ was an artifact of the uranyl nitrate starting material. The ESI and multiple-stage CID spectra resulting from the use of fresh uranyl nitrate synthesized from UVIO3 are shown in Fig. 2. The dominant ions generated by ESI using the synthetic salt in H2O/CH3CH2OH were [UVIO2(OCH2CH3)(CH3CH2OH)2]+ and [UVIO2(NO3)(CH3CH2OH)2]+ at m/z 407 and 424, respectively. CID of [UVIO2(NO3)(CH3CH2OH)2]+ (MS/MS stage, Fig. 2b) caused the elimination of a CH3CH2OH ligand to leave [UVIO2(NO3)(CH3CH2OH)]+ at m/z 378, or loss of HNO3 to generate [UVIO2(OCH2CH3)(CH3CH2OH)]+ at m/z 361. Subsequent CID of [UVIO2(OCH2CH3)(CH3CH2OH)]+ at m/z 361 created [UVIO2(OCH2CH3)]+ at m/z 315 (spectrum not shown), consistent with our earlier investigation of uranyl alkoxide cations . The dominant product ion generated by CID of [UVIO2(NO3)(CH3CH2OH)]+ at m/z 378 (MS3 stage, Fig. 2c) was [UVIO2OCH2CH3]+ at m/z 315, with [UO2(NO3)]+ at m/z 332 appearing at a relative intensity of ~ 5%. CID of [UVIO2(OCH2CH3)]+ (MS5 stage, Fig. S1c) generated products such as [UVO2(O=CH2)]+, [UVIO2(CH3)]+, and UVO2+ (m/z 300, 285, and 270, respectively), consistent with a previous study by our group using the LIT . As with the other experiments performed with the LIT in this study, including those that used the commercially available salt, subsequent CID of [UVIO2(NO3)]+ (MS4 stage, Fig. 2d) created [UVO2(O2)]+ and UVO2+. The last goal in this study was to determine whether the difference between the previous and current results, with respect to the dissociation of [UVIO2(NO3)]+, is due to the presence of significant levels of background H2O, or the specific ion trap used in the MSn experiment. As noted in the “Experimental Methods” section, the LIT was vented and kept at ambient temperature and pressure for 12 h. Our hypothesis was that the typical humidity of the ambient air would lead to relatively higher H2O levels in the vacuum system and ion trap for a short period of time after pump down. Therefore, after the instrument returned to typical operating pressure (ca. 1.0 × 10−6 Torr in the vacuum chamber), the MSn experiment using ethanol-coordinated [UVIO2(NO3)]+ was repeated to make a direct comparison to the experiments run under the “low” H2O level conditions. The CID spectra, initiated using the [UVIO2(NO3)(CH3CH2OH)2]+ precursor, are provided in Fig. 3. Under the high H2O conditions, the dominant product ion observed following CID of [UVIO2(NO3)(CH3CH2OH)2]+ (MS/MS stage, Fig. 3a) appears at m/z 396 (throughout Fig. 3, H2O adducts to CID product ions are indicated with an asterisk). The product ion at m/z 396 corresponds to the H2O adduct to [UVIO2(NO3)(CH3CH2OH)]+ (m/z 378). Other true dissociation products at the MS/MS stage include [UVIO2(OCH2CH3)(CH3CH2OH)]+ at m/z 361 and [UVIO2(OCH2CH3)]+ at m/z 315. Prominent H2O adducts to these fragment ions appear at m/z 442, 414, 379, 351, and 333, demonstrating that the level of background H2O was indeed higher. Subsequent CID of [UVIO2(NO3)(CH3CH2OH)]+ at m/z 378 (MS3 stage, Fig. 3b) primarily generated [UVIO2(OCH2CH3)]+ at m/z 315 and mono and di-hydrates of the ion at m/z 333 and 351. The [UVIO2(NO3)]+ ion was also generated at nearly the same relative intensity as in the low H2O conditions. In contrast to the experiments under low H2O conditions, subsequent CID of [UVIO2(NO3)]+ (Fig. 3c, MS4 stage) under the high H2O conditions produced [UVO2(H2O)]+ at m/z 288 and UVO2+ at m/z 270, exactly the results obtained in our previous investigation using the 3-D ion trap . This result strongly suggests that the differences in product ion formation are not due to the specific ion trap used for the experiments, but instead to the presence of higher levels of background H2O in the earlier study. One additional hypothesis tested was that [UVO2(O2)]+ would undergo a ligand exchange reaction with H2O. Our motivation for this was a set of earlier studies by our group which showed that (a) gas-phase complexes containing UVO2+ ligated with two or three σ-donating acetone ligands react with O2 to form complexes with composition [UVO2(A)2,3(O2)]+ (A = acetone, acetonitrile, etc.) [60, 61, 62] and (b) the O2 ligand is easily eliminated by CID or exchanges for neutral ligands such as H2O, acetone, or acetonitrile by IMR . Using the relatively low residual H2O conditions in the LIT, the ion at m/z 302 (presumed to be [UVO2(O2)]+) was generated by MSn CID of the [UVIO2(NO3)(CH3CH2OH)2]+ precursor, and then isolated and allowed to react with background H2O for periods ranging from 10 to 1000 msec (Fig. 4a–c). Despite the low levels of background H2O, reactions with the neutral species can still be observed, especially when using relatively long isolation/reaction times. The spectra shown in Fig. 4a–c clearly show that the product ion generated by IMR appears at m/z 288, consistent with the exchange of O2 for H2O by reaction 3. Subsequent CID (Fig. 4d) of the ion at m/z 288 causes formation of UVO2+ by loss of H2O. This behavior is therefore consistent with our earlier studies of ligand exchange reactions of O2 adducts to UVO2+ complexes, and with the composition assignment of [UVO2(O2)]+ for the m/z 302 ion. One remaining question is the mechanism by which NO is released from [UVIO2(NO3)]+ to make [UVO2(O2)]+. A study by Frański  showed that NO is eliminated from Ca2+, Sr2+, and Ba2+ complexes with nitrate, but mechanistic details and energetics were not provided. Schröder and coworkers  demonstrated that decomposition of nitrate will occur for gas-phase complexes of Co and Ni. For the case of Co, NO+ was observed and attributed to the dissociation of [CoNO3]+. For the Ni system, loss of (neutral) NO was observed from the mono-hydrate of [NiNO3]+. An alternative to direct ejection of NO would be isomerization of nitrate to peroxynitrite (reaction 4), followed by decomposition and elimination of (neutral) NO. This is the reverse of the well-known isomerization of peroxynitrite to nitrate (and hydrogen peroxynitrite to nitric acid) after creation of the former by reaction of NO and superoxide ion [66, 67, 68, 69, 70]. The exact mechanism by which [UVO2(O2)]+ is generated in the present study remains unclear and would benefit from a detailed quantum chemical study. Whatever the mechanism, our results strongly suggest that the decomposition of [UVIO2(NO3)]+ involves the initial elimination of NO. To summarize, in this study, we revisited the dissociation of complexes composed of uranyl nitrate cation [UVIO2(NO3)]+ coordinated by alcohol ligands (methanol and ethanol) using the 2-D LIT. With relatively low levels of background H2O, CID of [UVIO2(NO3)]+ primarily creates [UVO2(O2)]+ by the ejection of NO (reaction 2). However, under conditions in which the level of residual H2O is higher, CID of [UVIO2(NO3)]+ instead leads to formation of [UVO2(H2O)]+ and UVO2+, consistent with our earlier investigation of similar systems on a 3-D quadrupole ion trap. Our experiments further illustrate the impact of residual H2O in ion trap instruments on the product ions generated by CID and reveal the correct dissociation pathway for [UVIO2(NO3)]+. Based on these new results, we can revise the apparent intrinsic dissociation reaction for [UVIO2(NO3)]+. It is reasonable to assume that CID of [UVIO2(NO3)]+ initially creates [UVO2(O2)]+ by elimination of NO (reaction 2). The [UVO2(O2)]+ product can further dissociate by loss of O2 to leave UVO2+, consistent with the dissociation pattern observed on the LIT instrument. Knowing that [UVO2(O2)]+ can undergo a spontaneous and rapid exchange of O2 for H2O (reaction 3), the earlier results on the 3-D ion trap may have involved a two-step process: the initial formation of [UVO2(O2)]+, followed by rapid exchange with H2O to leave the species at m/z 288. This is essentially reactions 2 and 3 in rapid succession. Both [UVO2(O2)]+ and [UVO2(H2O)]+ may dissociate to leave UVO2+ at m/z 270. We therefore conclude that dissociation reactions in our previous study using the 3-D trap were influenced by the relatively high levels of residual H2O, and the results obtained on the 2-D ion trap more accurately reflect the intrinsic CID pathway for [UVIO2(NO3)]+. MVS received support for this work in the form of start-up funds from the Bayer School of Natural and Environmental Sciences and Duquesne University. Laboratory space renovation was made possible with support from the National Science Foundation through grant CHE-0963450. This work was also supported in part by the Robert Dean Loughney Faculty Development Endowment.